While I am relatively new to the Aussie Spec Fic community, I have been a member of groups that operate in a similar dependent, close knit fashion for most of my life. These experiences have left me convinced that there is a certain type of person vital to the health of such communities, without whom they cannot thrive. These are the people who spend their time promoting and building up the achievements of others, rather than focussing on themselves. Putting others first is not easy to do, but there are some people who do so consistently. I’m delighted to welcome one such person to my blog for today’s Wednesday Writer – Sean Wright. I love living in the future. I grew up in a time before the internet, before mobile phones, in a remote town at least 1500 km away from any major city. My first brush with fandom came with the ABC’s running of Doctor Who (until the late 80’s the only TV channel we had). Myself and four friends formed the Dr Who gang, our arch enemies were the Spades – think the Sharks and the Jets but with flowing multicoloured scarves and Men at Work rather than Leonard Bernstein . This was primary school. For many years Dr Who was the only game in town (Blake’s 7 I can dimly remember and it didn’t get the reruns) and ours the only fandom we knew – our main activity consisted of raising funds to buy BBC novelisations. While the rest of Australia was aware of Dr Who Fan clubs, writing and reading fanzines, we were living an isolated idyllic existence. VHS (video tapes) brought with it Star Wars, and Star Trek and later Blade Runner, biannual trips to Victoria (my father got tickets as part of his commonwealth job) filled in some gaps with cinema (I stupidly went to see Beyond the Stars rather than Empire Strikes Back). But still we lived in somewhat of a vacuum. In the early nineties, introduced to gaming( pen and paper) other aspects began to filter into my view. Magazines (albeit three months out of date) featured all aspects of fan culture and I picked up my first copy of Aurealis (Issue 9). These were sporadic though, arriving and or stocked at the whim of the local newsagent (sure I could have subscribed, but $24 was a lot upfront for me at the time). University was my first real introduction to fandom in any sort of community sense. The internet had arrived, though it was early days – cc mail and Netscape. The benefits of having a group of like minded individuals, however, was offset by the fact that we were all rather short of dosh. Still the conversations and the joy to be had discussing the latest Babylon 5 episodes are a happy memory. Work then took over and working two jobs and paying off a house meant little time for delving too deeply into fan culture and I was still living in isolated circumstances. Sure DVD’s came on the scene, the town now had a cinema but a largely transient population meant that social circles were hard to maintain let alone fan communities. But skip forward to now. I live rurally, perhaps more isolated than before, but closer to capital cities. I connect not only to the local fan scene but to the rest of the world. I can leave messages on forums, read digital copies of fanzines for free, write on author’s blogs, and download books that never would have made it to our shores ten years ago. I talk regularly with authors, have interviewed them with me sitting in the middle of wheat fields and them atop mountains thousands of kms away or indeed across oceans. Last night I sat on Twitter, compiling a selection of tweets – pictures and announcements, from the Aurealis Awards so that others unable to make it could get a sense of the proceedings. It was almost as good as being there. Yes I love living in the future. Sean Wright (AKA Sean the Blogonaut, Sean the Bookonaut) considers himself an aspiring writer, he tends to do quite a lot of aspiring and not much writing. 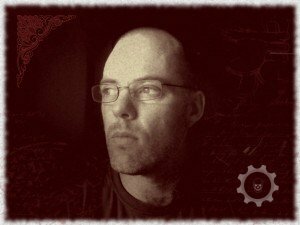 He blogs at Adventures of Bookonaut in attempt to keep himself sane and connected with other humans who share his tastes in fiction and to comment on and support the Australian speculative fiction scene. He has lived remotely for most of his life and currently lives rural South Australia, in the midst of wheat fields, in a 120 year old farmhouse which has its own history book but no ghosts. Sean has worked as a teacher librarian, pizza delivery driver, a security guard, a workplace trainer for an international company and as an activities coordinator for a community mental health service. This entry was posted in Geek, Writing and tagged community, Sean Wright, Wednesday Writers on May 16, 2012 by David. Aww shucks, nice intro mate. Despite the fact that so many people rely on technology in their day to day lives, I think they often forget how it has really and drastically affected the lives of some, and, particularly in your case, allowed them to contribute so wonderfully to a community beyond geographical limitations. I really loved your Aurealis storify post too. Thanks, David, for sharing Sean’s story with us on your site.